A perfect way to finish a meal - rhubarb and ginger make a stunning combination. Serve these individual puddings with Waitrose Fresh Vanilla Custard. Preheat the oven to 180°C, gas mark 4. Grease 6 x 150ml metal pudding pots or individual pudding basins and line the bases with a small disc of baking parchment. Spoon 1 tablespoon of the stem ginger syrup into the bottom of each one. 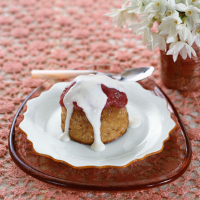 Place the prepared rhubarb, 50g of the sugar and the remaining 2 tablespoons of ginger syrup in a medium pan. Cover and cook over a low heat for 10 minutes, stirring halfway through, until the fruit softens. Simmer uncovered for a further 20-30 minutes until you have a dry purée. Allow to cool. Using a wooden spoon or an electric whisk, beat the butter and remaining sugar together in a mixing bowl until pale and creamy. Gradually beat in the eggs and vanilla extract. Finely chop the stem ginger and, using a metal spoon, fold into the mixture together with the flour. Gently fold half the rhubarb mixture into the sponge mixture. Spoon into the prepared pots. Place the pots on a baking sheet and cook for 20-25 minutes until risen, golden and firm to the touch. Run a round-bladed knife round the edge of the puddings to loosen them before turning out onto plates and removing the baking parchment. Serve immediately, spooning the remaining rhubarb and some warmed Waitrose Fresh Vanilla Custard over each pudding. For a stronger ginger flavour, simply double the amount of stem ginger in this recipe. Cape Promise Private Reserve Noble Late Harvest, Worcester, South Africa - a blend of grapey Muscat and crisp Chenin Blanc - is a sweet wine with good acidity.